On 16 september, in the framework of “Clean Up the World-Clean Up Georgia ” campaign a clean-up action was held in Zestafoni municipality, which was organized by the local coordinator of the Greens Movement of Georgia / Friends of the Earth Georgia, during which Zestafoni- Tskhratskaro 7 km stretch has been cleaned up. Within the action 5 m3 of waste were collected with participation of 50 volunteers. On 16-17 in the framework of “Clean Up the World- Clean Up Georgia” campaign a clean-up action was held in Gori municipality, during which central areas of the villages Ateni, Uplistsikhe and Khidistavi were cleaned up along with shoreline of river Tana. On 16 september, in the framework of “Clean Up the World- Clean Up Georgia” campaign a clean-up action was held in Kareli municipality, during which 9 April Park area and station surrounding areas were cleaned up. The event has been organized by regional coordinator of Greens Movement of Georgia/ Friends of the Earth Georgia with active participation of local authorities and residents. Around 30 volunteers took part in the action. About 2.5 ha area has been cleaned up and 0.8m3 of waste were collected. On 16 september, In the framework of “Clean Up the World- Clean Up Georgia” campaign a clean-up action was held in Gurjaani municipality, with participation of Gurjaani municipality self- government employees, public school teachers and students, representatives of local population. During the action were cleaned up centers of the villages. In total, 1100 participants took part in the action. Around 800 km2.area has been cleaned up, about 28 m3 of waste were collected and taken to the landfill. On 16 september, In the framework of “Clean Up the World- Clean Up Georgia” campaign a clean-up action was held in Sighnaghi, organized by the regional coordinator of Greens Movement of Georgia/ Friends of the Earth Georgia and with support of local authorities. Within the action which involved representatives of local population were cleaned up town and rural centers surrounding areas. On September 16 in the framework of “Clean Up the World - Clean Up Georgia” campaign a clean-up action was held in Kutaisi, organized by the regional coordinator of the Greens Movement of Georgia / Friends of the Earth Georgia. 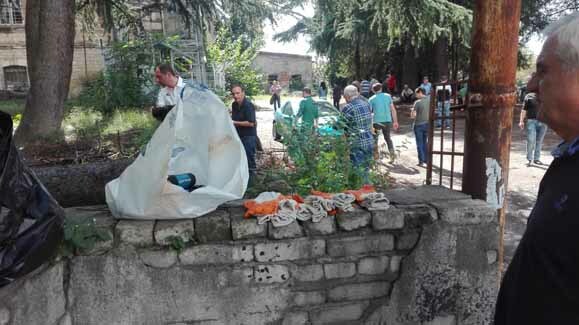 Together with organizers Tabukashvili street 50 residents of №187, №189 and №191 residential buildings took part in the action.